The book series is a “companion investigation series” to a fictional thriller DeLonge worked on called “Sekret Machines: Chasing Shadows” and is positioned as a collection of interviews with high level government intelligence workers, military officials, and scientists that seeks to explore the possibility of extraterrestrials. The first in the series, titled “GODS,” will be released on March 7, a week after the novel “Chasing Shadows” goes on sale. DeLonge is also working on a sci-fi movie called “Strange Things,” which focuses on Southern California skateboarders who investigate UFOs. DeLonge and his former bandmates, Mark Hoppus and Travis Barker, have a rocky relationship. 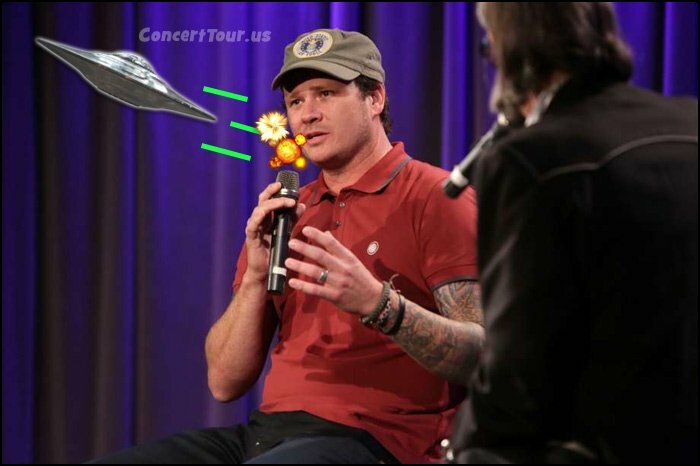 Both parties disagree on the circumstances that led to DeLonge’s split from the band, with DeLonge saying he left the band to pursue studying extraterrestrial life, and the remaining band members maintaining that it was a bit more complicated than that. Tom DeLonge speaks about his thoughts back in 2015 at The Grammy Museum.